"Swingender" Vibrato-Belcanto, atemberaubende Staccatotechnik, attraktive Superdynamik (...) Spitzenniveau! These are brilliant performances of works that more or less reinvented the clarinet as an instrument of brilliance. (...) Kari Kriikku has such a wide range of expression and such an intelligent approach to the music. Kari Kriikku is absolutely sensational throughout (the First Concerto) and keeps the listener riveted by his wonderful virtuosity and range of colours, contrasting utterly briilliant passagework with beauutifully controlled phrasing. Outre le clarinettiste Kriikku, prodige d'omniprésence lyrique et d'élans intimes admirables autant que virtuose débordant de verve et d'humour, l'Orchestre Symphonique de la Radio d'Helsinki et son chef Sakari Oramo (...) doivent être cités en exemple pour leur accompagnement exhaustif, chaleureux, nuancé, équilibré, qui colle à l'oeuvre par l'esprit et le coeur. Highly recommendable disc (...). (Kari Kriikku's) refined tone and virtuosity (...) would surely have inspired Weber too: this is playing of quite exceptional quality by a master of the instrument. Kriikku's mastery and stylish acumen are beautifully supported by conductor and orchestra, sensationally so by the string players during the Quintet. 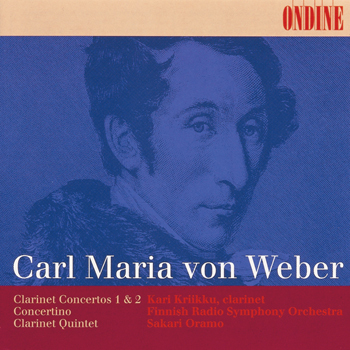 Finnish star clarinetist Kari Kriikku performs the clarinet works of Carl Maria von Weber. This recording has contributed to the rediscovery of the two concertos, one concertino, and one quintet, which Weber composed for the great clarinet soloist of his time, Heinrich Joseph Bärmann (1784-1847). Sakari Oramo here conducts the Finnish Radio Symphony Orchestra in the orchestral works, while the New Helsinki Quartet performs together with Kari Kriikku in the Quintet (which was previously released in 1994 as ODE 820-2). Kari Kriikku plays his own cadenzas.